The 288MW Storheia windfarm is the biggest of the six windfarms in the Fosen wind project. Image: courtesy of Statkraft / Fosen Wind. Fosen will become the biggest onshore wind park in Europe, upon completion. Image: courtesy of Ole Martin Wold. Storheia windfarm will produce more than one billion kWh of electricity. Image: courtesy of Line Partner / Comrod. The project is part of the bigger 1,000MW Fosen wind project, which includes the construction of six windfarms, and will become the biggest onshore windfarm in Europe, upon completion in 2020. Storheia is the biggest windfarm under the Fosen project. Construction of the Storheia windfarm began in August 2016 and is expected to be completed by 2019. It is expected to generate more than one billion kWh of electricity, which will be sufficient for approximately 50,000 Norwegian homes. Fosen Wind DA, a joint venture (JV) between Statkraft (52.1%), TrønderEnergi (7.9%), and Nordic Wind Power (40.0%), owns the Fosen Wind project, while Statkraft is the project developer. The Storheia windfarm will consist of 80 Vestas V117 turbines with an installed capacity of 3.6MW each. The turbines will be equipped with a transformer for increasing the machine voltage of 660V to 33kV, along with switching equipment. Expected to be installed during the second quarter of 2019, each turbine will have a hub height of 87m and a rotor diameter of 117m. The transformer station and service building at Storheia will be located in the eastern part of the licensing area. It will comprise appliance systems, switch systems, and other technical installations. The wind turbines will be connected through 33kV internal cables. Major infrastructure works include the construction of access roads, turbine foundations and seating locations for assembly lines, internal roads, a transformer station building and three transformer cells, and one service building. Installation of optical fibre cables and 36kV high-voltage (HV) cables will also be undertaken. Construction of the 60km-long internal road network at Storheia began in April 2017. The roads will have a width of 5m and a total traverse width of approximately 10m. 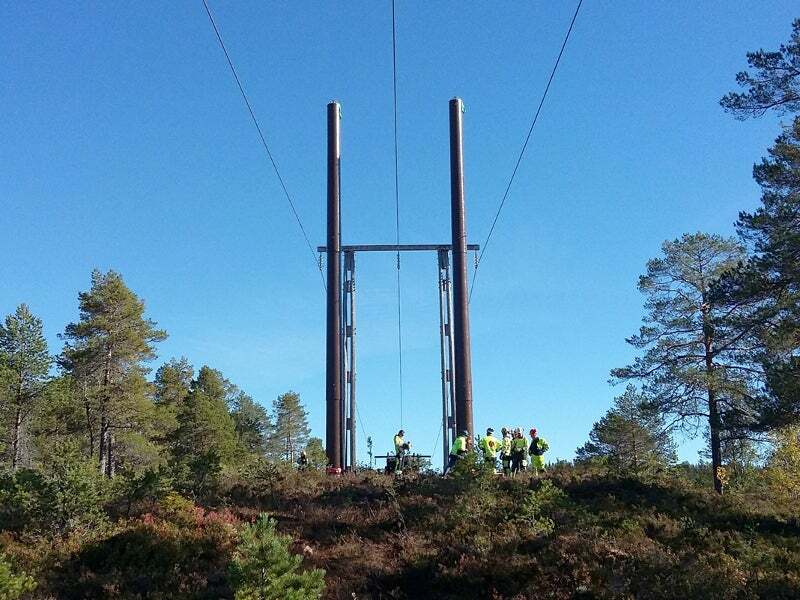 Power generated by the Storheia windfarm will be connected to the new 420kV power line being constructed from Namsos to Trollheim via Fosen, which includes the Namsos-Storheia and Storheia-Trollheim sections. The new line is being constructed to transmit the power generated by the Fosen wind park to the national grid. Vestas Wind Systems is supplying the wind turbines for the Storheia windfarm as part of the 278 wind turbine supply contract for the Fosen Wind Park. Kolektor Etra is the supplier of the transformers, while Statnett was engaged for the construction of the new 420kV power line. The consortium of ABB and Bravida Norway is supplying the 132kV air-insulated outdoor switchgear and 33kV air-insulated indoor switchgear, along with the corresponding protection and control for the entire Fosen project. ABB is responsible for the delivery, design and construction, while Bravida is responsible for the installation. Veidekke Entreprenør was awarded a $400m contract for infrastructure works at the Storheia windfarm in February 2017, while Johs J Syltern was engaged for the construction of the access roads. "It is expected to generate more than one billion kWh of electricity, which will be sufficient for approximately 50,000 Norwegian homes." Veidekke engaged Ramboll to conduct detailed power, road and geotechnical engineering, as well as landscaping and environmental studies. Stjern Entreprenør was awarded the contract for the construction of a quay at Monstad for the Storheia wind project, while the mains and fibre works contract was awarded to Linjepartner in January 2017. Estimated investment to cost €1.1bn ($1.26bn), the six windfarms comprising the Fosen project are expected to produce 3.4TWh of renewable energy a year. The 255MW Roan and the 288MW Storheia windfarms began construction in April 2016 and are expected to be completed by 2019, while the remaining four windfarms Harbaksfjell (108MW), Kvenndalsfjellet (100.8MW), Geitfjellet (154.8MW), and Hitra (93.6MW) are expected to be developed from 2018 to 2020. The project will comprise a total of 248 Vestas V117-3.45MW and 30 V112-3.45MW wind turbines. OWEC Tower offers design solutions for offshore substructures in the renewable energy sector. BRAUER Maschinentechnik provides high-performance servicing and construction of industrial gears for almost all industries.